Kings Park, Long Island, New York, U.S.
John Peter Petrucci was born on July 12, 1967, in Kings Park, New York, to an Italian American family. He picked up the guitar at the age of eight because his older sister was allowed to go to bed later in order to practice the piano. However, he decided to quit the guitar when his attempts to stay up late were unsuccessful. He picked up the guitar again at the age of 12. Petrucci has said he committed to practicing guitar 6 hours a day when he discovered it was his passion. His early influences were bands like Led Zeppelin, Black Sabbath, AC/DC, and later developed an interest in progressive rock and heavy metal, exemplified by Rush, Yes, Iron Maiden, Dixie Dregs and Metallica. Petrucci also wrote and recorded two instrumental soundtrack songs for a Sega Saturn game titled Digital Pinball: Necronomicon. Each track is roughly two minutes long, and are named simply Prologue and Epilogue. In a spoof rock band, Nightmare Cinema (which was the Dream Theater members changing instruments for encores), he used the "alternate stage name" Johnny James. In 2012, Petrucci was invited once again to join Joe Satriani on the G3 tour, along with Steve Morse. He was accompanied by bassist Dave LaRue and drummer and Dream Theater bandmate Mike Mangini. In 2018, Petrucci joined Joe Satriani on the G3 tour. They were accompanied by Uli Jon Roth on the European leg of the tour, and Phil Collen in North America. John Petrucci during a concert in 2012. Petrucci is respected for his variety of guitar styles and skills. One of the most notable of these is his high-speed alternate picking which, as he himself claims, requires a "strong sense of synchronization between the two [playing] hands." John is notable for frequent use of the seven-string electric guitar, which he says he uses as a writing tool, taking advantage of the extended range for heavier riffing and to play extended range runs as part of a solo. Moreover, Petrucci often combines his metal shredding technique with a slower, emotive soloing style. His influences as a guitarist include Jimmy Page, Brian May, Eddie Van Halen, Steve Morse, Al Di Meola, Steve Howe, Allan Holdsworth, Stevie Ray Vaughan, Randy Rhoads, Joe Satriani, Steve Vai, Alex Lifeson, Yngwie Malmsteen and David Gilmour. Petrucci is Dream Theater's most prolific lyricist, with each album including at least three songs featuring his lyrics. Some of Petrucci's notable songs include "Metropolis, Pt. 1: The Miracle and the Sleeper", "The Spirit Carries On", "The Great Debate", "In the Presence of Enemies", and "Through Her Eyes". Petrucci has occasionally used real-life experiences for lyrical inspiration, as heard in songs such as "The Count of Tuscany", "A Nightmare to Remember" and "Endless Sacrifice". In the beginning of 2016 two new releases were announced: the Dunlop John Petrucci signature Cry-Baby wah, and the Mesa/Boogie JP-2C John Petrucci guitar head amp, which is available in three different versions: regular, rackmount or Limited-edition. 1993 Images and Words: Live in Tokyo First Dream Theater live DVD. Includes extended version of "Take the Time." 1995 Rock Discipline – VHS John Petrucci does a DVD on guitar warmups, tricks, exercises, and his gear. 1998 5 Years in a LIVEtime The only live Dream Theater DVD with Derek Sherinian. 2006 Score 2DVD's recorded at Radio City Music Hall on April 1, 2006 New York, US Celebrating Dream Theater's 20th Anniversary. They performed this concert with a symphony orchestra. 2008 Chaos in Motion 2007–2008 Released September 30, 2008. Documents the band's 2007/2008 Chaos in Motion and Progressive Nation tours. 2014 Breaking the Fourth Wall 2DVD's recorded live at the Boston Opera House on March 25, 2014, released on September 29, 2014 on CD, DVD, and Blu-ray. ^ "Interview with John Petrucci (Dream Theater)". Wikimetal. Archived from the original on 2014-10-06. ^ "Dream Theater's guitarist John Petrucci featured in Super Mario Bros. main theme remix with FamilyJules". Loudwire. ^ "VIDEO: Super Mario Bros. theme by FamilyJules (feat. John Petrucci)". YouTube. Retrieved January 30, 2018. 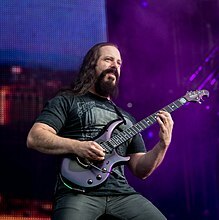 Wikimedia Commons has media related to John Petrucci.